Text: Mom, can you drop off my lunch? I didn’t have time to make it. Please! I am starving! Text: Can you pick up some milk? We are out. And I am starving because there was no milk this morning for cereal. Daddy finished it last night. Who still eats cookies and milk at 50 years old, anyway? Text: Did you see my Instagram? Go like it please!!!!! I have almost 200 likes! Text: Do I have practice tonight? I have a ton of homework. I can’t go, if I have practice. Mom, why aren’t you answering me? Ok. I looked at my email. There is no practice. Text: Mom, did you get this text? You have already used 75% of your data of this billing cycle. It is not because of me. Lilly has been snap chatting all day. Text: I need shoes for the prom. We only have a month. Do you like these? I know you said do not buy shoes online but I love them. Text: Ok fine. But we need to go this weekend. I still have to get my dress shortened. Text: MOM!!!!!!!!!!! Take down that baby picture of me on Facebook! I look terrible. And do not post anything again that I have not seen. 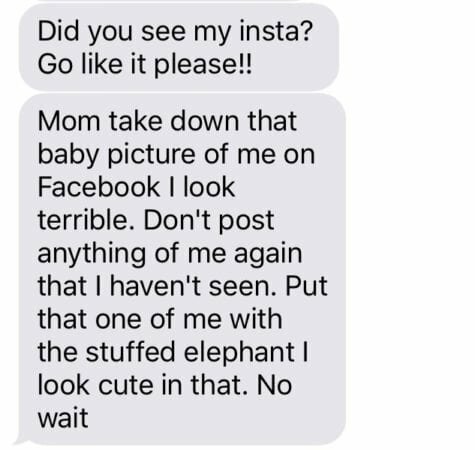 Post the one where I am holding that stuffed elephant. I look really cute in that. No wait. Don’t post that until I look at it again to be sure. Text: By the way, mom. Nobody writes BTW when they mean, by the way. And nobody uses LOL anymore. It’s so last year. Text: Sarah got into Ohio State!! Can I buy her some Buckeye clothing? I know you said no more college clothing but I just want to send her one thing. Text: I can’t! You know I do not have any of my own money. Text: I have been looking for a job. I swear. Like all the time. And we pause for a moment of silence. Text: What’s for dinner? The lunch was kind of gross. I do not eat peanut butter and jelly anymore. As of yesterday. Did you not hear me when I said that? Text: Kiley just got asked to the Prom. Now we need a bigger limo. There are 38 of us. Make it 40. Go look at Kily’s Instagram post. So adorbs. Text: Can you pick up my contacts? I think they are in. Text: Fine, I will get them. What do you do all day, anyway? Text: Mom, I have a headache and no it’s not because I am always looking at my cell. Can I take an Advil? Text: Yes, I will clean up my room! You already asked me like a 100 times. Text: I did clean it yesterday. It just got that messy again. Text: MOM, DID YOU PICK UP MILK? Text: I can’t stop for milk on the way home, I have to pick up my contacts and then I need to help Michael with Calculus. Not sure if I will be home for dinner. Wait, what are we having. Text: UGH!! I am sick of chicken. I am going to go to Qdoba with Michael later. Text: I finished my homework in study hall. Text: Did you like my Instagram post? Text: Where is daddy? He is not answering my texts. I need him to bring home paper from the office. Text: I know he is busy working, but I need it tonight because my paper is due tomorrow. Text: Mom, the paper is already done, I just have to print it out. And we pause for much-needed deep breath, the kind I learned in Yoga class, which I took months ago, when I had an abnormally free morning. Which as it turned out, I had the morning open because I had forgotten to show up for my son’s class trip. Text: I just had the best chicken salad at Dobes. This is my all time favorite restaurant. Text: Had no money for gas. Had to use your credit card. Text: I am looking for a job! Sarah couldn’t find a job either. It’s not just me, mom. Text: On my way home. Text: Hi Mrs. Mund. No, she is not texting and driving. This is Michael. I wrote that text. And we pause for a final moment of silence. Text: Can I go with Sarah to the mall tomorrow after school? I need prom shoes. Text: Why do I have to come downstairs to talk to you? I am in bed watching Netflix. Text: Fine, my show is over in like 10 minutes. But I need prom shoes so can we go this weekend? Text: LOL. That was actually funny, mom. Text: LOL is back in again. Text: I love you, too. Beth Mund has a Masters of Science in Psychology and is both a Certified Wellness Coach and Reiki Practitioner. 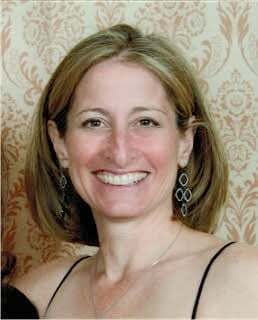 She has worked for many years guiding and mentoring both children and adolescents at an overnight summer camp. Her experience in business includes healthcare, financial, recruiting and management. Beth is passionate about writing, music, family time, and playing with her dog, Bella. She lives in New Jersey with her husband and three children. Most eye-opening experience was adopting her son from Russia. She feels our purpose in life is to love, everything else is just background noise. You can find Beth on her blog or on Facebook.